It was hard to find a photo of myself that I genuinely love, that doesn't show my face. Most of my favorite pictures are of me smiling or laughing, when it's not just my mouth turned up, but my whole face is animated with joy. But I can't share those pictures here. It's uneven because I cut out the proofs and scanned my favorites. This is a picture I've used in a few spots around my blog, sometimes with text over it, sometimes alone. I was a debutante my sophomore year of college. 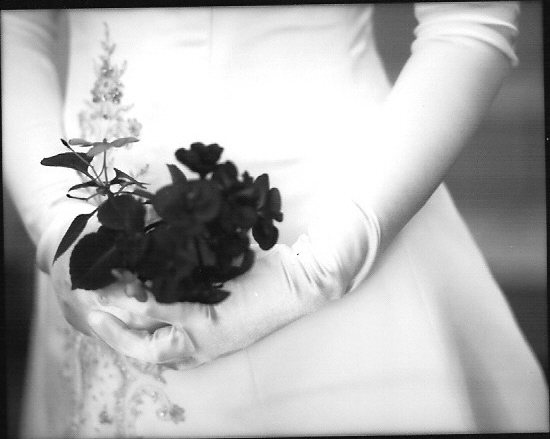 This involved many fun events, one of which was a photo shoot for my debutante portraits. We hired a local photographer* (who is brilliant and award-winning), and we received permission from a woman at church to use her gorgeous house (mansion) and backyard for the shoot. I love the simple elegance of this picture. It's so peaceful to me. Being a debutante was a very exciting, but busy period in my life. One of the quiet joys was feeling beautiful, and believing that feeling beautiful is okay. This picture helps me remember that. *If you live in the South, and you are interested in this photographer, email me. If I find out you're in the same southern state as my home state, I will be happy to provide you with his details. Good morning. I really like that picture. I stumbled across your blog being curious after a comment you made on another blog. You had mentioned Crohn's and thought I would check if you've written a bit about it. 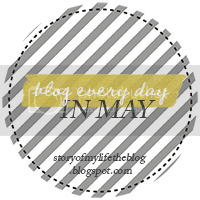 Then I noticed you were doing the Blog Every Day in May Challenge, which I am also participating in. Though, last night I missed my first entry :( because I fell asleep and didn't wake up until 1am. So I'd like to explore around some when having time. Good luck with the May Challenge! I am a bit sad I missed a day, but will catch up. Extend the challenge into June. Basically the same as catching up. If I'd actually read this at 1am, I would have told you to post late that night. I've had a few after-midnight posts that I totally counted as the day before. If I'm still awake, the day isn't over yet! I do have a Crohn's tag, if you check that out on the right.